Reasonable cost, good location, helpful employees, no cost wifi Internet, cleanliness and a good kitchen. These are the things we offer! It is a nice, clean hostel with a great location. The check-in and checkout was smooth. CLOSE TO EVERY PLACE IN TOWN, IN THE CITY CENTER, EVERYTHING IS ON THE WALKING DISATANCE, YOUNG BOYS AT THE RECEPTION ARE VERY GOOD, HELPFUL ABOUT EVERTHINGMREADY TO ANSWER TO ANY QUESTION. IT IS VERY GOOD THAT THERE IS AN ELEVATOR, BECAUSE THE HOSTEL IS AT THE THIRD FLOOR. The location was definitely the hostel&'s strongest factor! Everything was easily accessible along with the staff were extremely warm and friendly and helpful. The kitchen facilities were really clean and had everything that we needed and we got a great night sleep each night. Overall we had a really enjoyable stay and would recommend to anyone visiting Budapest. It has a small, home-like feel and is a wonderful spot for solo travellers or pairs of friends. People weren&'t there to party or be loud. Receptionists were very useful and were willing to present everything we needed for a wonderful stay. 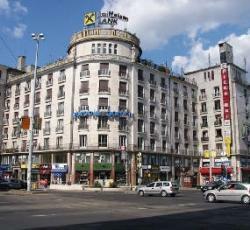 Very central location, on the city center and near a metro station. The place was pretty small, but that made everybody be together at the commom room. Friday and Saturday night the staff made pancakes. There was plenty of plugs on the room. I had a amazing stay, thank you! Free, delicious pancakes were definitely a bonus. Everything The room is nice The staff is so friendly and helpful It is a great deal We even get an upgraded offer! * Astoria City Hostel rated 4.78 out of 5 based on 9 customer reviews. Hostel reviews with a star rating are sourced from HostelBookers. If you find Astoria City Hostel with the same booking conditions at a lower rate somewhere else on the internet after you have booked, we will refund you the total difference.